Do you know the secret to making sure your papers coordinate easily? Buy double sided papers! I cut this Webster's Pages paper and then turned it over to discover a great pattern on the back. So I put the two together and I love the background it formed! The stickers are both dimensional ones that I had in my stash. Easy peasy! 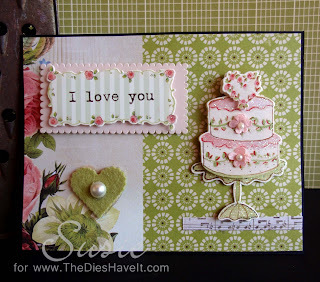 But I thought it needed a heart (a green heart), so I used a Spellbinders pinked heart die to cut the felt. I wanted it to pop up a bit, so I cut another one from chipboard to go beneath it. This was a quick card, but sometimes that is exactly what we need. As a natter if fact, I am going to show you another quick one tomorrow! Oh my...this one is just so pretty!! So many nice things to look at on your blog!